Celebrate Selena’s life and legacy at Fiesta de la Flor, which is returning to the Latina Superstar’s home town for its third year March 24-25. Fans can once again get to the festival safely and stress-free by taking advantage of the festival’s park and ride system. 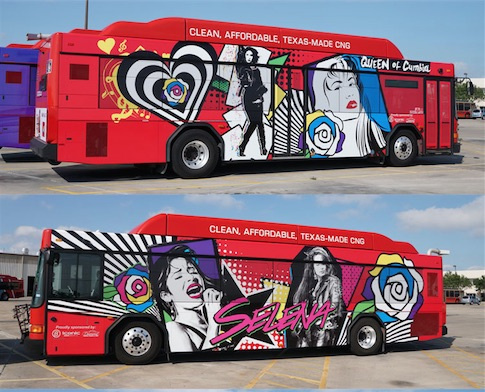 The Corpus Christi Regional Transit Authority has wrapped several city buses in tribute to the Queen of Tejano. These same buses will be used to transport fans — at no cost — to Fiesta de la Flor. Shuttle service will run from Corpus Christi City Hall at 1201 Leopard Street and the Nueces County Courthouse at 901 Leopard Street. Park your car in either lot for free and then ride the shuttle to the festivities. The shuttle runs from 4 p.m. to 12 a.m. on Friday, March 24, and from 12 p.m. to 12 a.m. on Saturday, March 25. The buses will operate back and forth throughout the duration of the festival. Read all about Fiesta de la Flor and this years festivities here. Visit the festival’s website at www.fiestadelaflor.com for tickets and more information.